Velvet Disease or Piscinoödinium or Oödinium pilularis is a parasitic infestation that is very common among both salt and freshwater fish. This parasite is opportunistic and is present in most commercial aquariums. When a fish is stressed due totemperature fluctuations, poor water quality or other stressors they become susceptible to the parasites. Velvet Disease is classified as a dinoflagellate. It is both a protozoan like the Ich parasites but contains Chlorophyll so it is also considered a type of algae. It survives by finding a stressed host and attaching itself mostly to the gill or fin tissue where it kills the cells and consumes the nutrients directly from the fish. If left untreated it often leads to death. Physically, Velvet looks like a gold, rust or yellow dust, finely sprinkled over the fish. In fact, it can be so difficult to see that often a flashlight is needed to reveal it. This shiny powder appearance has lead to many other names besides Velvet including Rust and Gold Dust Disease. 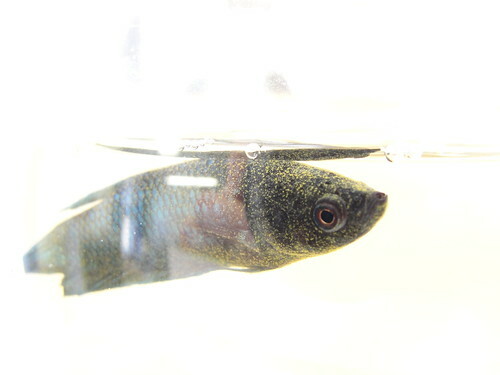 Besides seeing the parasites directly on your fish you may notice other symptoms including the telltale rubbing against rocks, gravel or other décor. This is common with external parasites and is an attempt by your fish to dislodge the pests from its body. As the disease develops, symptoms may worsen and include lethargy, loss of appetite, labored breathing and clamped fins. Over a short time, the protozoa detach from their host and enter their free-swimming stage where they divide and multiply many times. This is when they are most vulnerable to medications but may not be obviously present in the tank. It is very important when medicating that you finish the entire course of treatment regardless of weather or not you still see the parasites present. Follow the directions on the medication package closely. Once the parasites multiply they must find a new host (or the same old one) within 24 hours to survive. Because of this life cycle it may appear that your fish has gotten better but really once the Piscinoödinium completes reproduction the worst is yet to come. Now many more protozoa are present in the water and waiting to attack your fish. If diagnosed early, Velvet is fairly easy to treat. First, you should remove your betta and place him into a hospital tank away from any other fish. Oödinium is highly contagious and keeping the infected fish in a community tank can put others at risk. Make note, the medications for Velvet may be toxic to other species like some fish, snails, invertebrates and aquarium plants as well. Also, any filter media should be removed so as not to eliminate the medication from the water. Next, slowly raise the water temperature to 80˚F – 82˚F [26.6˚C – 27.7˚C]. Because you don’t want to further stress you fish, be sure to only increase the temperature by no more then 2˚F or 1˚C in a 24 hour period. A more rapid temperature fluctuation could cause additional harm. It’s recommended you use a commercial Velvet medication like Mardel’s CopperSafe® or Jungle’s Velvet Guard®. Reducing the amount of light getting into the tanks by keeping the hood lamp off and covering the tank may help to combat the parasites as well. To prevent the Piscinoödinium parasites from infesting your tank there are some simple precautions all aquarists can tank. First, always quarantine new fish for 3 – 4 weeks before adding them to a community tank. Be sure to always test your water parameters regularly and keep tank water clean by performing frequent and regular water changes. Avoid stressors like temperature and pH fluctuations and provide a nutritionally balanced diet by offering a variety of live and frozen foods.